Hubbard will launch Scotsman’s new, greener ice machines at Hotelympia on stand 2250 in the Professional Kitchen Show area. The EcoX range delivers less impact on the environment and lower running costs. All models use either hydrocarbon R290 or carbon dioxide R 744 refrigerants, so they have almost zero impact on the environment in terms of ozone depletion potential or global warming potential. They are fully compliant with the F Gas Regulations. The EcoX range includes models that make gourmet ice cubes, dice ice, cubelet ice and flake ice – so there’s an EcoX for every foodservice application, from posh G&Ts to bottomless drinks, from cocktails to iced coffee, and from fish displays to fast food soft drinks. 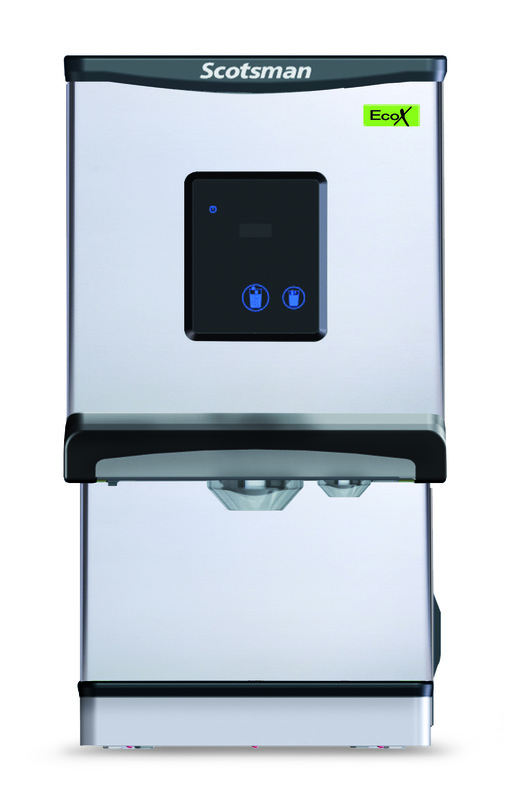 A highlight of the range is the DXN 207 cubelet ice dispenser. Designed for self-service, this table-top dispenser has a compact footprint just 427mm wide by 553mm deep yet can store 200 servings and dispense up to 2,400 servings per day. Cubelet ice, like nugget ice, minimises water use because of the way the ice cubes are made, by compacting and extruding flake ice. This means just about all the water is turned into ice, so wastage is minimal. Hubbard will also be showing the difference that the latest water treatment technology makes to the taste of water – and ice. Visitors will be able to test the results by comparing the taste of untreated water with water that’s been through a 3M filter, which Hubbard recommends for use with Scotsman machines. Joining Scotsman and 3M on the Hubbard stand will be the latest warewashers from Comenda, including the new Hi-Line range. Full details will be unveiled at the Show.